Risoul, 27 May 2016 – The Italian rider Vincenzo Nibali (Astana Pro Team) has won Stage 19 of the 99th Giro d'Italia, 162km from Pinerolo to Risoul. Mikel Nieve (Team Sky) finished second, with Esteban Chaves (Orica Greenedge) third. Esteban Chaves (Orica Greenedge) is the new race leader overall and takes the Maglia Rosa. 2 - Mikel Nieve (Team Sky) at 51"
3 - Esteban Chaves (Orica Greenedge) at 53"
2 - Vincenzo Nibali (Astana Pro Team) at 44"
3 - Steven Kruijswijk (Team Lotto NL - Jumbo) at 1'05"
4 - Alejandro Valverde (Movistar Team) at 1'48"
5 - Rafal Majka (Tinkoff) at 3'59"
Seconds after the stage finish, the stage winner said: "I've won by rage today. It hasn't been easy to handle everything that has happened over the past few days. I dedicate this victory to Rosario [a young pupil of his who accidentally died two weeks ago]. I'm very happy. It's been a terribly hard stage. I want to keep my feet on the ground. There's another hard stage to contest tomorrow". The Maglia Rosa said: "It's been difficult. 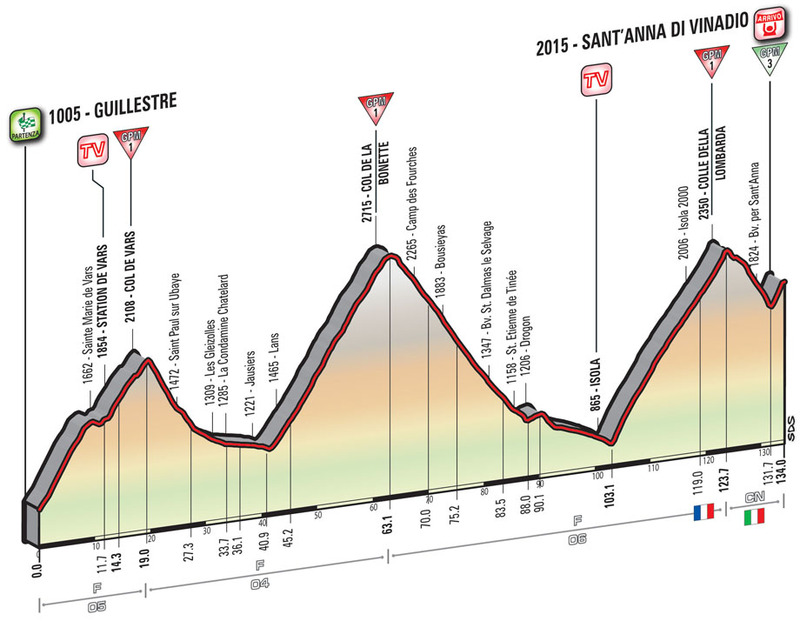 I'm happy to have the Maglia Rosa and be so close to winning the Giro but there's another hard stage tomorrow. I'm sorry for Steven Kruijswijk. He made a small mistake in the downhill but he defended himself very courageously. I've tried to stay with Nibali but he was too strong for me today". This short stage across the Alps features a remarkable 4,100m rise and drop in as little as 134km, with a sequence of four climbs and three descents – with no flat stretches in between. 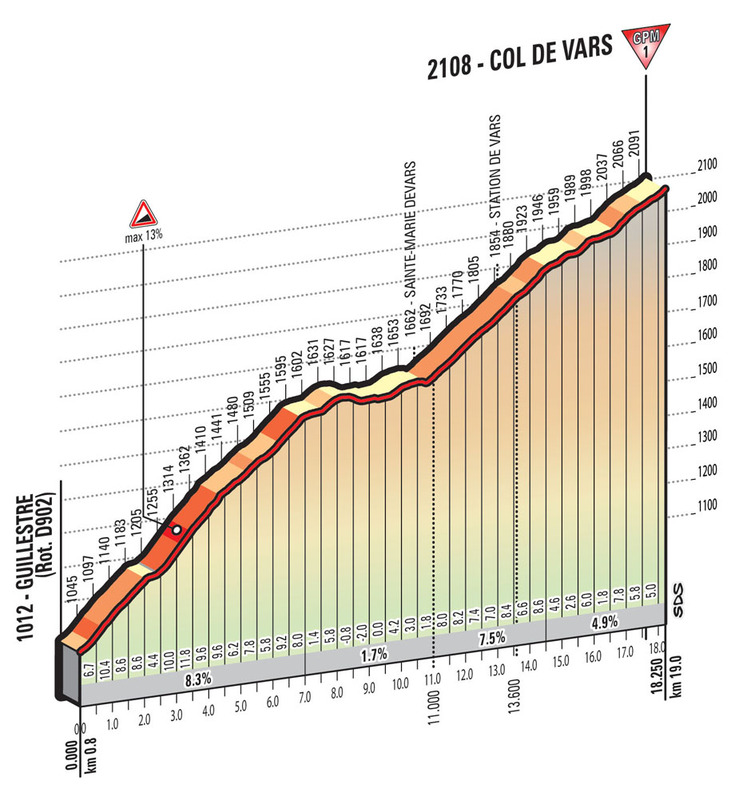 The route climbs up Col de Vars (19km), Col de la Bonette (22km), Col de la Lombarde (20km) and the final 2.3km leading to the Sant’Anna Sanctuary. The road is wide and well-surfaced along all of the climbs (mostly above 2,000m), with many hairpins. 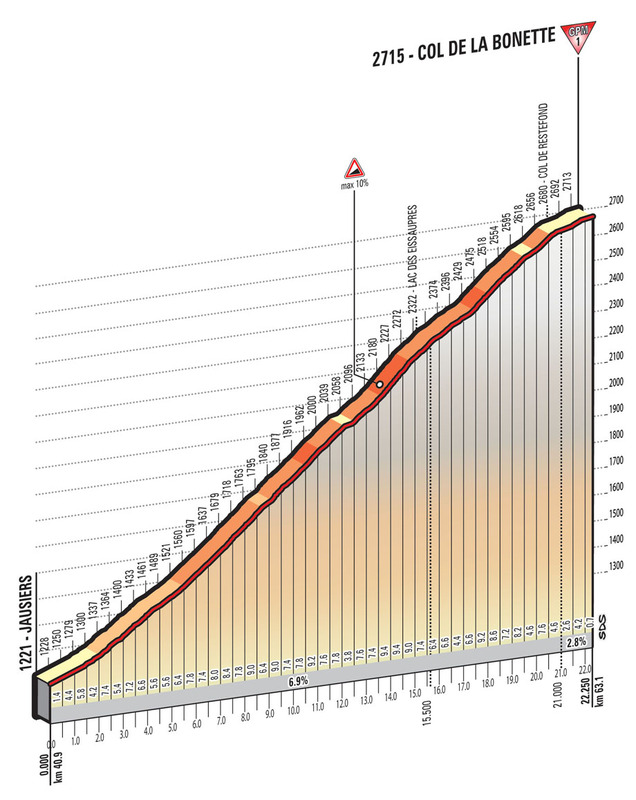 The roadway only narrows along the technical descent from Col de la Lombarde, all the way up to the last 2.3km. 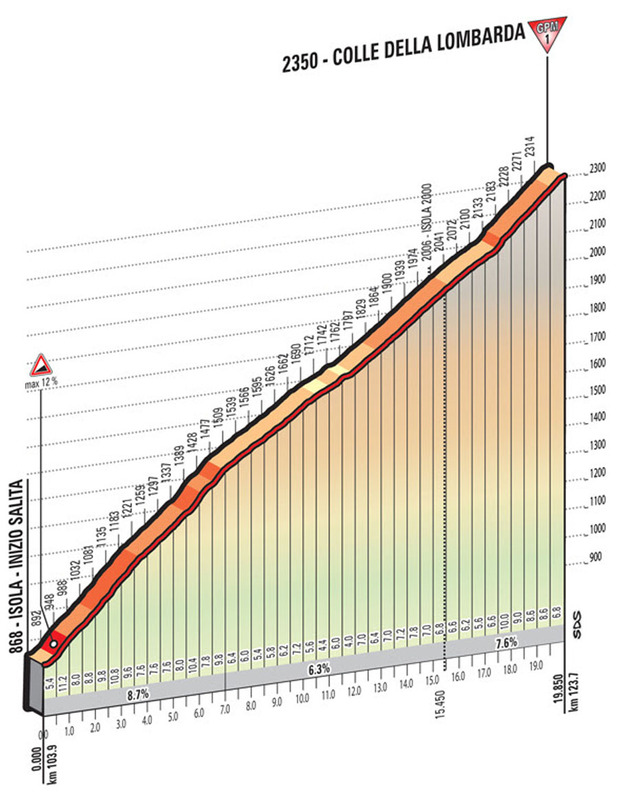 The route climbs steadily over the last 2,300m, with gradients ranging from 9% to 11%. The road is quite narrow, with a few hairpins. The last few hundred metres of the route run among the Sanctuary’s buildings, with short uphill stretches and tight bends. The home straight (50m) is on a 6m wide asphalt road.